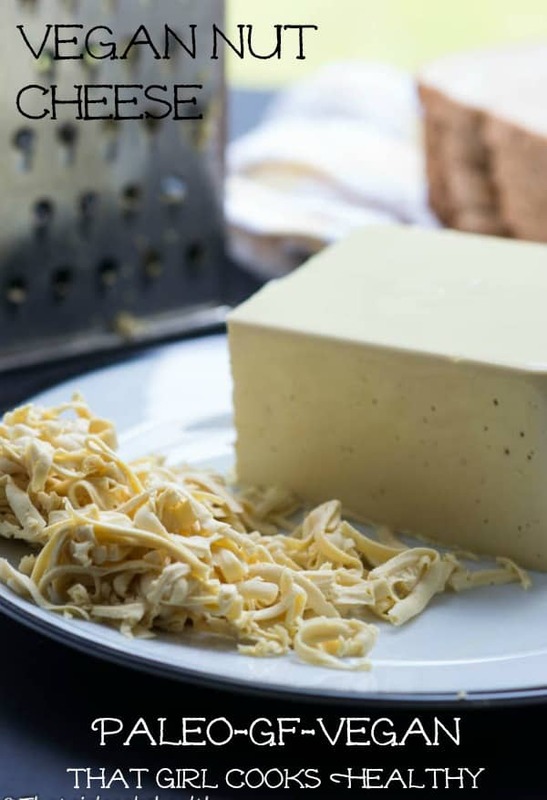 Vegan nut cheese – Irresistible dairy free nut cheese made with almonds, so versatile it even grates just like conventional cheese. This vegan nut cheese is so foolproof and ever vegans and dairy free person dream come true made in the comfort of your very own homemade with a small amount of ingredients. When started my food blogging adventures I initially made this vegan cashew cheese recipe with some baby carrots to dunk in the dip. How this current nut cheese differs from the one I previously uploaded is the use of agar agar plus the use of almonds to boot. What is vegan nut cheese? In short vegan nut cheese is a cheese that is safe for the lactose intolerant and those omit all animal produce from their diet. It varies. 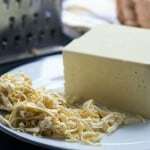 You will find commercial manufactured vegan cheese is made from soy protein for that shiny, slick and rubbery texture. Oils that turn to a solid i.e coconut or palm oil are used to yield that solid/block structure. Other ingredients such as thickening agent like agar gar, nutritional yeast and creamy nuts (cashew, almonds, macadamia) are common ingredients. Agar agar is the vegan’s answer to gelatine, made from dried seaweed, it comes in the form of powder or flakes. The great thing about agar agar is it’s versatility, you can use it to mould jelly, custard, as a thickener in soup, just about any recipe that requires emulsifying. For this recipe you will need a saucepan to start the nut cheese process. The saucepan is need to boil the water ready to stir in the agar agar. The agar agar need to dissolve (our thickening agent). From there you will add the water along with the listed ingredients to a high speed blender. Can you freeze vegan nut cheese? Yes, in fact the I do recommend freezing the contents once it has been pureed. Also for longevity, keep the store the solid cheese in the freezer for nest results. What is the taste and texture of the vegan nut cheese? The texture of the cheese is very much like you’re regular store brought made from cow’s milk. Again this is courtesy of the agar agar, don’t miss this step. 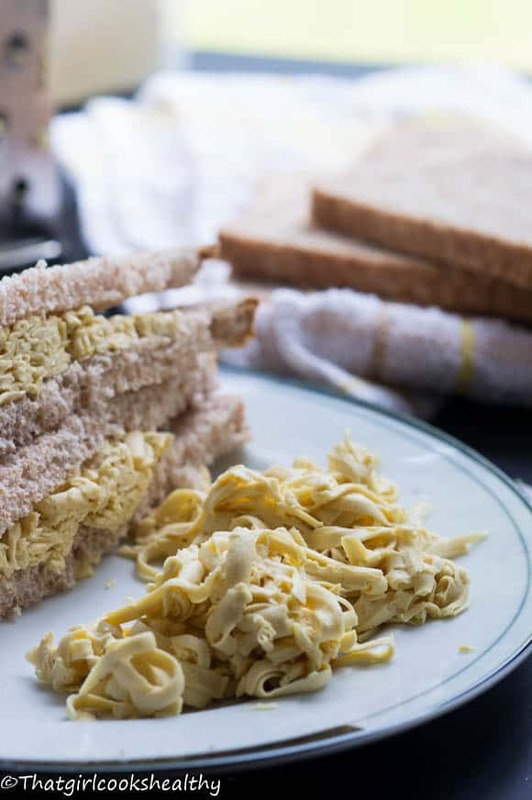 The cheesy flavour derives from the nutritional yeast which is a dried deactivated yeast full of B vitamins. Did I mention that the dairy free cheese grates and slices too? Oh yes it does! 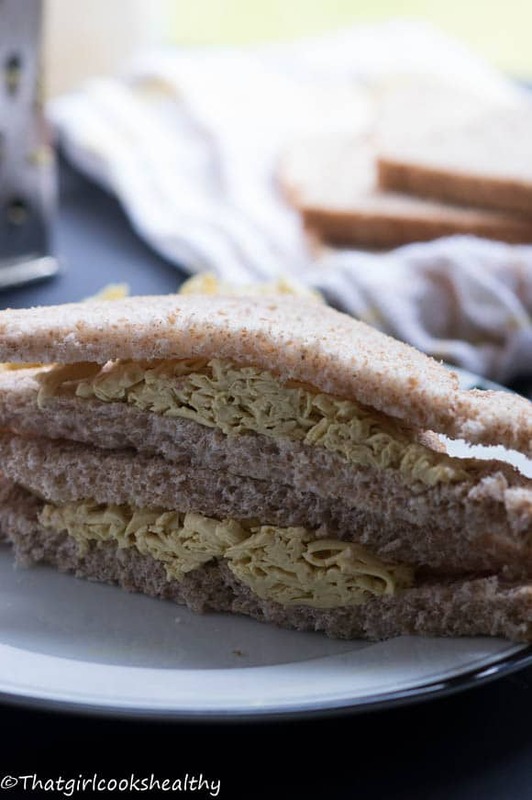 Don’t believe me, I couldn’t help but share this picture of the grated cheese sandwiched between some bread. The only downfall with this cheese is it’s lack of ability to melt, as it grates the texture remains unchanged. I tried making a vegan pizza and became elated by the prospect of chewing on a slice of glooey gluten free pizza, you know the type that stretches? Well that didn’t quite happen, it was quite funny at the time. Can I use alternative to almonds? Yes, some people prefer to use cashews or macadamia nuts. If you are allergic to nuts, according to my research you can use seeds i.e pumpkin, sunflower instead. There are other options out there to suit your dietary needs. To extend the life of the cheese, store in the freezer, use and re-freeze. Once frozen it take roughly 10 minutes to thaw out and ready to use. Bring the water to a boil and reduce to a simmer, as the heat level is reduced stir in the agar agar. Continue to stir for 5 minutes, during this time the agar agar will have dissolved. Once dissolved the water should begin to thicken a little. Add the remaining ingredients together with the water and pour into a blender. Blend into a smooth consistency. This is very interesting. I love almonds. Interesting addition of onion powder. I did not know that Agar Agar was a type of gelatin. Very interesting combination. Nor did I Gem, it’s a great vegan alternative, so bonus there. This is amazing! I saw your recipe for the loaded sweet potato skins with vegan cheese and my first thought was that I’d have to use regular cheese because all those vegan ones are super expensive where I live. So I was extremely excited when I saw the link to this homemade vegan cheese recipe! I’ve never thought of using agar agar for anything other than jelly before, so I can’t get over how inventive and creative you are Charlene! Will definitely be trying this one. You should know me by now Jolie, I always manage to find a way to make alternatives. Speaking of which I’m working on a hybrid gluten free flour mix so I can create some flour based recipes. I also bought some nutritional yeast just yesterday at the health food shop, so it’s like the universe is just telling me to make this cheese… hahah! I hope you like it. 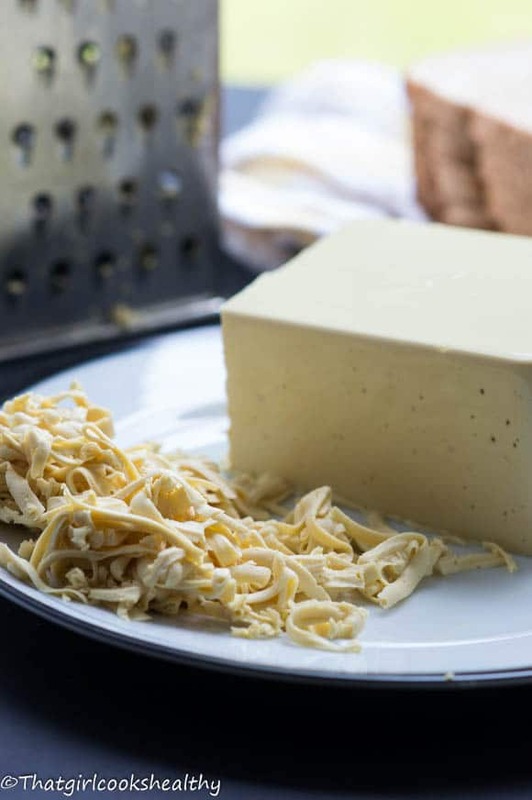 As I said in the post it doesn’t have a long shelf life so to speak (3 days max) so you might want to half the ingredients unless you intend to use the entire cheese block right away. Can this cheese be frozen and grated later? My 3 year old has multiple food allergies and will be the only one eating this so I don’t want it to go to waste. Thanks! Hi Grace, yes the cheese is freezer friendly. I either half the ingredients to make a very small batch to use or freeze and thaw out if I’m not using it straight away. Let me know if you have any more questions as I am happy to assist you. Step 6….do you press it into a mold or dish? Does it set as it cools? Hi Danielle, you can use either but a mould will be easier for removal. Yes as it begins to cool down it will set/thicken up, but not as solid as conventional cheese. That brings me to my next point, I would suggest storing it in the freezer because the shelf life (so to speak) in relatively short ( a few days maximum, preservative free). It thaws out quite quickly, I simply use what I need and return to the freezer unless I’m using it as soon as I’ve made it. Let me know if I can be of further assistance. The recipe calls for 1/4 freshly squeezed lemon juice. 1/4 what? Thanks! Sorry 1/4 cup of lemon juice. I have updated the recipe to reflect this. Question regarding the almonds: if one were to switch pre-ground almonds with the 1 cup of whole almonds you call for, how much would that be in cups or grams? Hi Rebekah. Thanks for asking! I haven’t made the nut cheese with ground almonds however if I were to hazard a guess I would say you’d need roughly 300g worth of the ground stuff to equalise the suggested amount. Yes, Bethany. You can use cashew nuts instead. Well…I mad this “cheese” yesterday exactly per instructions and found myself fighting with agar agar after I poured (gel’d it?) into the blender. All the other ingredients just sat on top of this “gel”. I do have a really good blender. I took it all out and tried to mix it a little at a time. After 3 hours (no kidding!) I finally made it by adding more and more water. The end result was a “stiff cheese”. I froze some and left some in the fringe to taste on a bread today. It was somewhat bland. I just wander if I misunderstood your directions? I boiled and simmered 1 1/2 cups water then added the agar agar. I am very new to vegan foods and although I have been trying for close to a year now to produce something palpable… it just doesn’t work as good as I hope. Hi Ela. I think you are being way too hard on yourself. All of the ingredients should puree once blended together. The cheese should be stiff so you didn’t do anything wrong per say. I’m not sure why it taste bland because the nutritional yeast should make give off that cheese taste. That might just be down to personal taste (no pun intended) Does the cheese cut and grate? You are right when it comes to taste. I will try making it again but I won’t freeze it. After freezing, I took the “cheese” to defrost in the fridge and funny thing happened; it tasted pretty good !? But… it was the consistency of mascarapone cheese. Not solid nor grateable. I’m not sure where I went wrong, especially when many people “made it” just fine to make solid “cheese”. Hi Ela. Sounds like the cheese texture was flawed because of the additional use of water. I know it’s tempting to follow your own judgement but next time follow the quantity of the recipe to the tee and you will see the difference. At least you have some spreadable cheese to work with in the meantime.